This year’s Pro Championships offer a fairly unusual set of storylines. The top two seeds, Revolver and Ring of Fire, are both hoping to bounce back from disappointing performances at their last tournament. Some teams in the middle of the pack have shown flashes, but the likes of Sub Zero and Dig have more to prove to be deigned championship contenders. And there are still teams angling to lock up bids as the postseason draws closer. 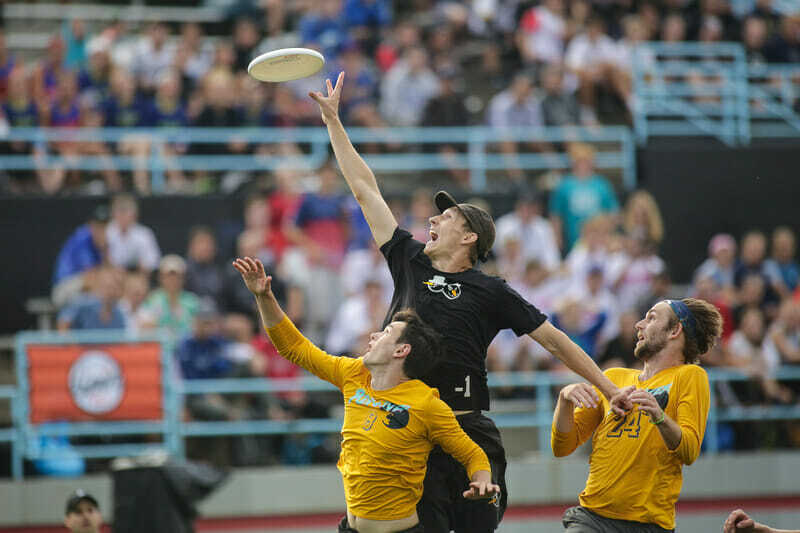 The biggest on-field story in the Men’s division over the past month was #1 San Francisco Revolver’s surprising defeat in the semifinals of the U.S. Open. A red hot Sub Zero team, spurred on by a raucous home crowd, felled the prohibitive favorites from the Bay. After a few weeks to stew, Revolver is back in action to squelch any doubts about their position atop the men’s division. Revolver will be looking to repeat history, as they suffered a similar fate last season at the U.S. Open only to pick up steam during the Pro Championships. They ended the regular season in stride and kept their winning streak running all the way to a national title. Part of Revolver’s struggles against Sub Zero earlier this summer seemed to arise from personnel issues, which shouldn’t be as much of a problem this weekend. While the defending champs will be without Russel Wynne, Michael Spear, Julian Childs-Walker, and Tom Doi, Revolver is able to put Ashlin Joye back into the rotation after he missed the U.S. Open. Joye is the one Revolver player who doesn’t quite have a direct replacement, and reintegrating the talismanic center handler should be a boon for an offense that coughed up a few crucial breaks without him. #4 Raleigh Ring of Fire suffered their own disappointment at the U.S. Open, failing to keep pace with PoNY in the semifinals after a blistering first half of near-flawless ultimate. Perhaps more surprising than that defeat is the fact that you could classify a game featuring Ring of Fire as “near flawless.” The traditional, if somewhat tired, adjectives that stuck to the Raleigh team in the past (tenacious, gritty, insatiable, bruising, etc.) don’t seem to ring true the way they used to. Ring’s plethora of offensive toys has moved the Raleigh team somewhat away from its hardscrabble roots towards a less textured style of play. It may take a return to the function, if not the form, of those older Ring teams to get Raleigh back on track this weekend. In both of their big losses this season – against PoNY at U.S. Open and Colony at Club Worlds – Ring’s defense let them down, proving unable to stop a Jimmy Mickle-led attack for long stretches. That may be a tall task for any team, but for years Ring of Fire has been counted on to be a fly in the ointment of even the best offenses. As the team’s identity becomes proactive, perhaps Ring is finding some difficulty in being the machine itself and not just a wrench hurled into the works. As we come thundering down the regular season’s home stretch, the fight for the last few strength bids ratchets up the stakes of otherwise routine matchups. #16 Washington DC Truck Stop and #19 Philadelphia Patrol are both just both outside of the bid bubble, which puts the fate of the Mid-Atlantic Region on a knife’s edge in just about every one of their games this weekend. Truck and Patrol have the clearest incentives of any team at the tournament: win and get a lifeline at Regionals or lose and face a steep climb to Nationals. Per Ultiworld’s algorithm guru Cody Mills, here is what each team’s situation looks like. Truck essentially needs to make a semifinal and hang tight against Revolver in pool play. They could potentially survive a pre-semis loss in the bracket if they had a couple blow out wins somewhere along the line, but missing the bracket entirely would essentially end their chances of earning a bid. Patrol has a rougher road. They would need to win by multiple points over PoNY, Machine, and Bravo, win a pre-semi, and lose by no more than one goal in their semifinal and against Ring in pool play. So can either team pull that off? Truck Stop has shown flashes, but that 4-9 record speaks for itself. After losing both experience and youth from last season’s run to a national semifinal, Truck is stuck needing to remake its identity on the fly this season. DC’s roster is full of versatile players, exemplified by Rowan McDonnell, whose athleticism and throwing ability allow him to play virtually any role on the field. This lets the team play adaptable ultimate, frustrating any opponent who does one thing well. The big question for Truck, however, is whether they can figure out exactly what it is that they do well, and get on the front foot instead of playing just a reactive game. Patrol are a mere 1-6 on the year against teams that made Nationals last season, but in several of those games, they were neck and neck before going off the boil down the stretch. Coach Charlie Hoppes believes some of that comes down to the team’s youth, as the average age of the squad fell from 28 in 2017 to just over 22 this season. While Patrol has suffered some growing pains with their new roster, the high variance of youth is a double-edged sword. If Patrol’s new crop can learn from their early season lumps, they have shown the ceiling to start notching big wins. The only other potential for bid intrigue comes from #3 New York PoNY and #5 Minneapolis Sub Zero. While both are currently above the cutoff line, a poor weekend could send them into Regionals down a strength bid. While both teams had great U.S. Opens, they will need to finish the regular season strong to ensure that their performances from earlier this month don’t go to waste. Can any of the teams in the middle of the pack push themselves ahead this week? #7 Chicago Machine has been a little under the radar, but are the no. 3 seed because of a sneaky impressive season. They could get their first real scalp here, which would make everyone take them a little more seriously as a title contender. #8 Boston Dig are continuing to put it all together after their merger with Ironside in the offseason, which instantly catapulted them to top tier status. We haven’t seen Dig play since way back at Colorado Cup in early July, so this weekend will give us a taste of what they have been working on all summer. Is the Boston cocktail strong enough to justify the early season hype? After going 0-fer against American teams at the U.S. Open, #9 Denver Johnny Bravo need to prove here that their home field Colorado Cup win wasn’t a fluke. #14 Michigan High Five once again find themselves in the thick middle. We haven’t seen the heights that their breakout 2015 regular season promised for the Michigan-Ohio combo squad, but this season’s Pro Championships gives them the chance to notch their program’s first major tournament win. Comments on "Pro Championships 2018: Tournament Preview (Men’s)"